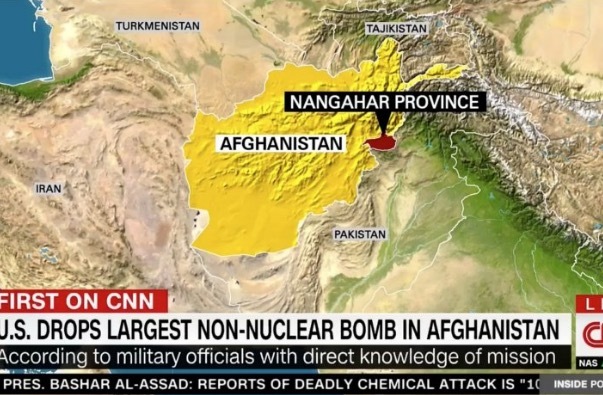 CLICK HERE TO WATCH LIVE – The U.S. on Thursday dropped its largest non-nuclear bomb in Afghanistan on Thursday, CNN reported. The 21,000-pound bomb, dubbed the “mother of all bombs” or MOAB, was dropped in eastern Afghanistan to target ISIS tunnels, according to CNN. The official name of the weapon is the massive ordinance air blast bomb, and it has never been used before in combat. CNN’s Barbara Starr said reconnaissance missions were being flown in order to assess the damage. Starr added that the strike would have had to be approved by Gen. Joseph Votel, the head of U.S. Central Command. This entry was posted on April 13th 2017 at 12:56pm/12:56 and is filed under Live News Column 1, Politics, Terrorism, World News. You can follow any responses to this entry through the RSS 2.0 feed.